Depending on your layout, raised decks are a perfect addition to two story homes. A custom raised deck provides additional living space, extending both your first and second level to the outdoors. From the materials, to the design to the aesthetics, our Omaha custom decking company builds raised decks that are durable and beautiful. With raised decks, as opposed to ground level decks, part of its usability, durability and aesthetic appeal is related to deck drainage. Deck drainage systems are ideal for raised decks because they deflect water by collecting it and driving it away from the home and foundation. Allowing air flow and ventilation is vital to the life of your home’s structure and of the deck. Deck drainage systems will also provide your Omaha home with more usable living space below the custom raised deck. It’s attractive and durable, and will help brighten the space below the deck – making it more usable and enjoyable. At Decks, Decks and More Decks all our custom decks are built with safety, longevity and beauty, all while meeting your family’s needs. A raised custom deck with a deck drainage system will only add to the function and beauty of your custom deck. This entry was posted in Custom Decks Omaha and tagged custom decks omaha, deck building omaha, decks omaha on January 10, 2017 by Decks, Decks and More Decks. The holidays are a time to be with people we love – eating good food, giving and receiving thoughtful gifts, playing games and making sweet memories. And while the holidays seem to be a likely time to create memories with family and friends – why not also during the warmer months? 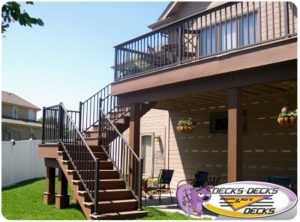 A custom deck built by our Omaha deck company is a perfect extension of your living space to host family and friends. So as you consider the things to give to your family this holiday and throughout the year, why not consider contacting Decks, Decks and More Decks for a free quote on a custom deck? For over 35 years we’ve been adding custom decks to Omaha homes with the highest quality craftsmanship, beautiful low-maintenance material and expert advice. Your home is your biggest investment and building a custom deck onto your home is investing in your property and in your family. Consider contacting Decks, Decks and More Decks this holiday season to get a jumpstart on a custom deck to enjoy this spring. A custom deck on your Omaha home is the perfect place to enjoy good food and good company once the ice and snow melt away.